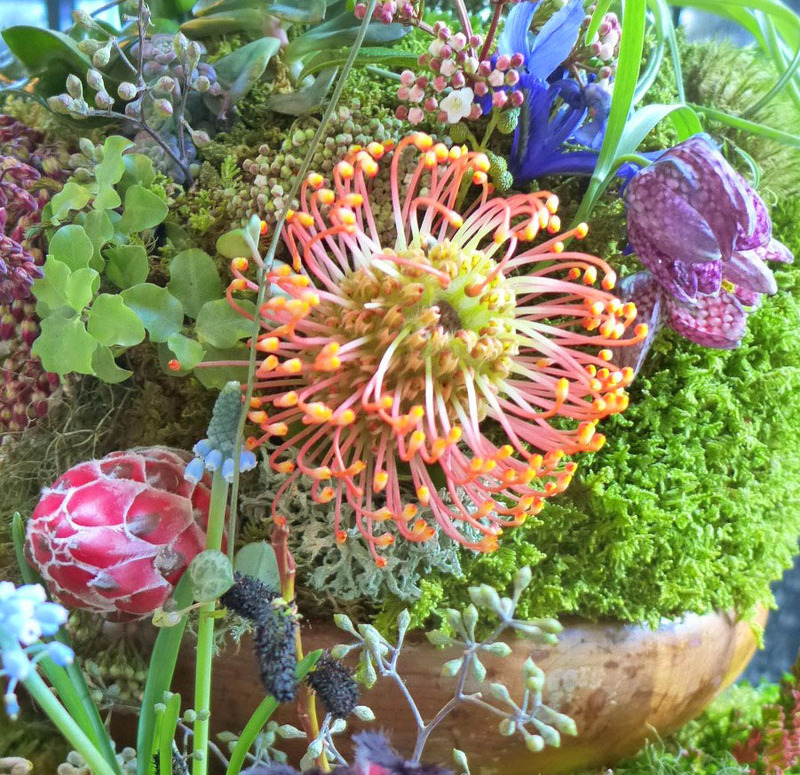 Every February the Northwest Flower and Garden Show swings into town, and transforms the halls of the Seattle Convention Center into a 5-day jolt of garden inspiration – or as their hashtag reads,”#SpringinFeb”. 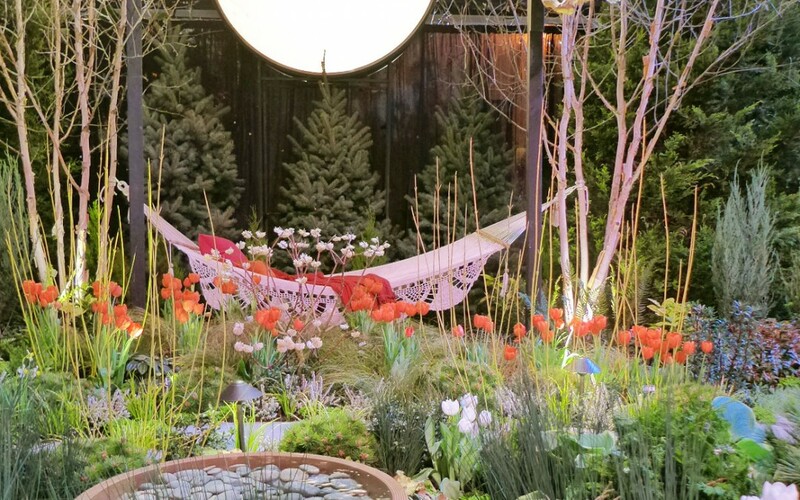 This year’s show, themed “Romance Blooms”, featured 23 display gardens, 9 City Living gardens (balcony gardens aimed at apartment and condo dwellers), over 300 vendors and the largest list of free seminars of any flower and garden show in the world. Whew! To say it was impressive would be an understatement. While inspiration was in abundance, it’s worth noting the relevant trends that are sure to last well into 2015 and beyond. 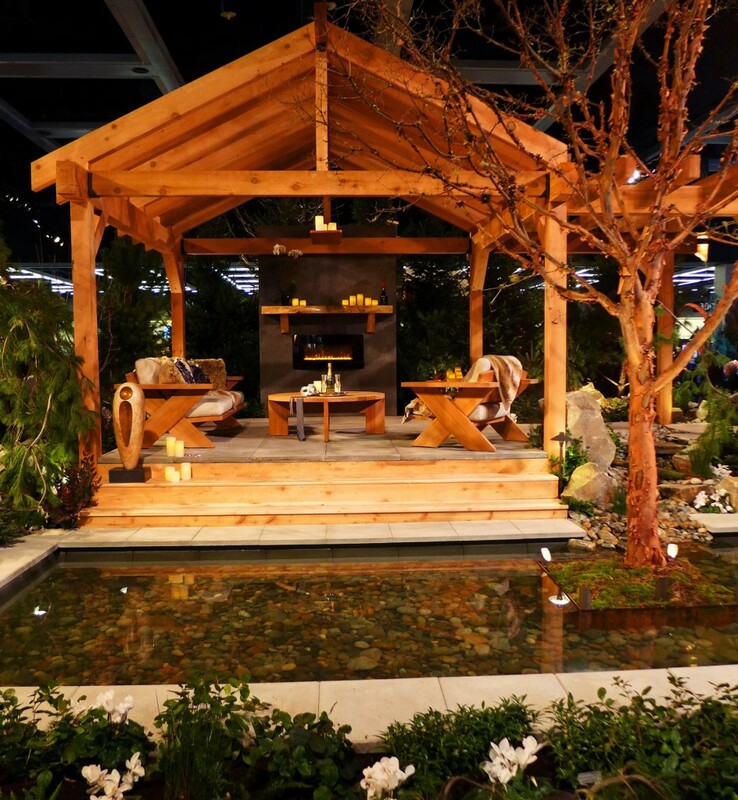 The designers and craftsmen behind the display gardens are not only garden creators, but dream creators as they provided show attendees the opportunity to fantasize of warm spring days and quiet summer nights spent in the garden. 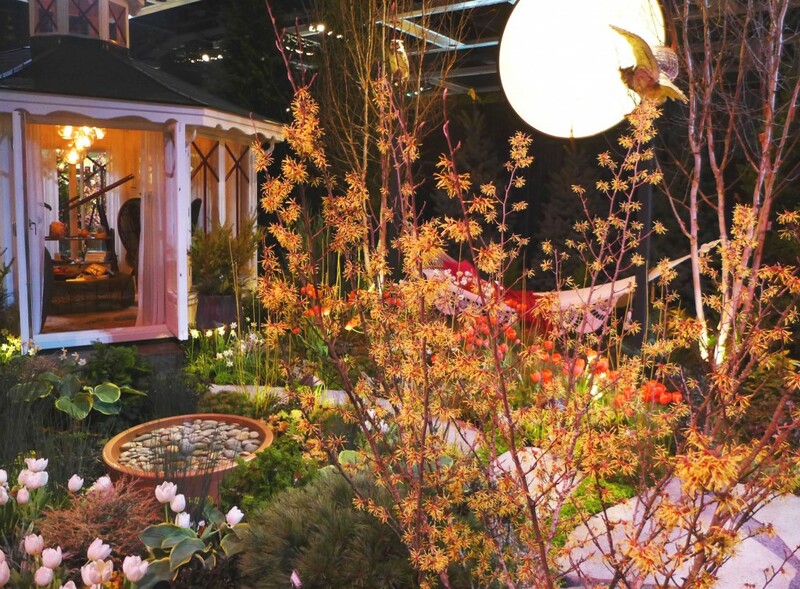 This year’s Founder’s Cup (best in show) and a gold medal were awarded to the Association of Professional Landscape Designer’s display garden, titled “Over the Moon”, in which a full moon cast a warm glow over the garden below. A hammock, central to the scene provided a place to rest and daydream while a traditional Scandinavian Pavilion offered shelter and a quiet respite from spring rain or hot sun. This garden, an oasis from our technology laden lives, taps in to our desire to unwind and unplug. Designed and created by Lisa Bauer of Chartreuse Landscape Design, Katie Weber of Katie Weber Landscape Design and Susie Thompson of Susie Landscape Designs. Karen Stefonick Design’s display garden, was an exercise in refined restraint. She carefully chose a minimal plant palette of primarily conifers and evergreens to provide structure and year-round interest. The bold wood structure and surrounding boulder catered to a masculine sensibility while the warm fire and cozy furnishings played to the feminine. What resulted was a sophisticated, uncluttered look that perfectly represents the trend towards creating a space with a seamless transition between indoors and out. 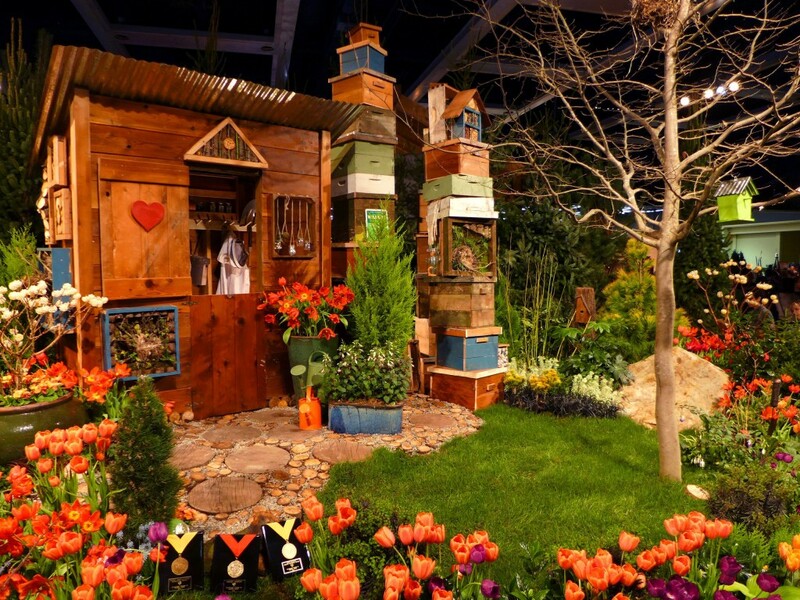 Stefonick’s display garden won the Sunset Magazine Award, 425 Magazines Editor’s Choice award as well as a gold medal. West Seattle Nursery – Birds do it… Bees do it. West Seattle Nursery’s display garden, titled, “Bees do it… Birds do it”, celebrated the marrying of beauty and productivity while highlighting the importance of creating sustainable and eco-friendly gardens where bees and birds are not only welcome, but necessary. A stacked bee house was the focal point while the surrounding garden burst with edible fruits and vegetables. The garden was constructed using recycled materials and salvaged wood including cut tree rounds. This garden was a prime example of the trend towards creating eco-friendly gardens and “up-cycling”, or re-purposing materials for a new use. West Seattle Nursery’s display garden won the Pacific Horticultural Society Award, the Fred Palmer Garden Creator’s Award, the South Sound Magazine Editor’s Choice Award as well as a gold medal. This year’s show included a new category titled, “City Living” that featured 9 display gardens sized 8 ft x 14 ft aimed at apartment and condo dwellers who may only have a small balcony or patio to work with. Ravenna Gardens – All You Need is Love… and a Garden! Ravenna Gardens was awarded the People’s Choice Award, Best Use of Theme and the Fine Gardening Award for their City Living space featuring a bench for two under a wood trellis and small bistro table for dining. 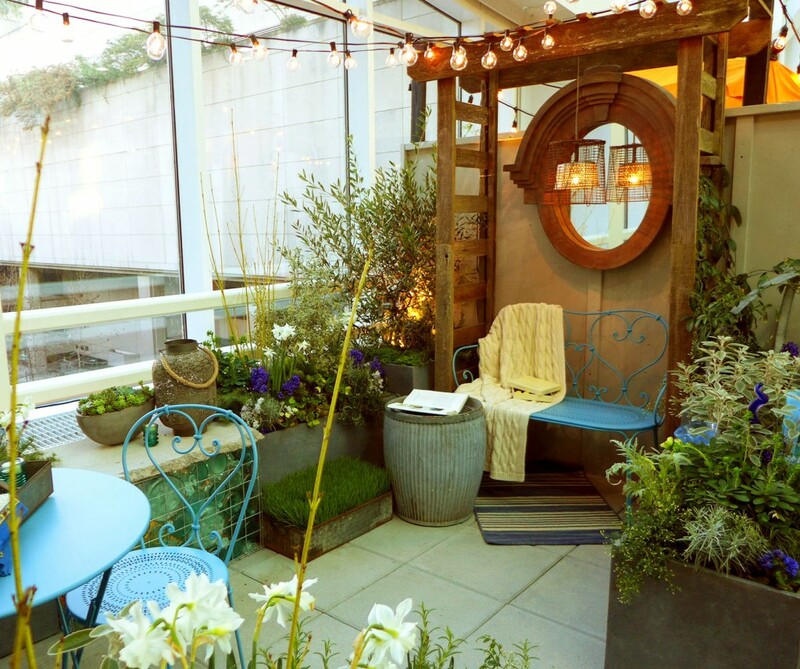 A string of globe lights over head and ample container gardens provided layers of texture and interest while calming blue accents in the furnishings and plantings imbued the space with a tranquil vibe removed from our busy everyday lives. Tip: They added a mirror to reflect light and create the illusion of a larger space. 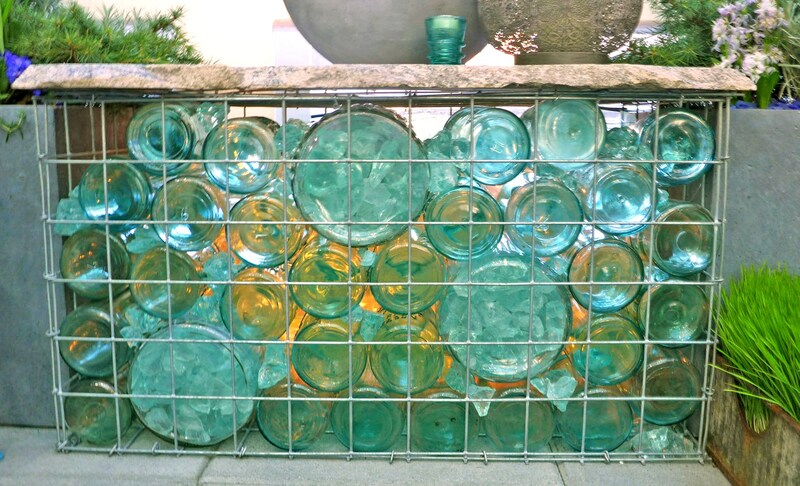 Ravenna Gardens also did an excellent job of playing with light and texture by creating a gabion bench filled with glass bottles of varying sizes – making it not only functional, but beautiful! RHR Horticulture’s modern City Living display was anything but stark and understated. Lush, complex and layered more aptly defines the space. Rare and unusual plants bust from the edges of their sleek black pots while baby lettuce and herbs mingled with colorful pansies. 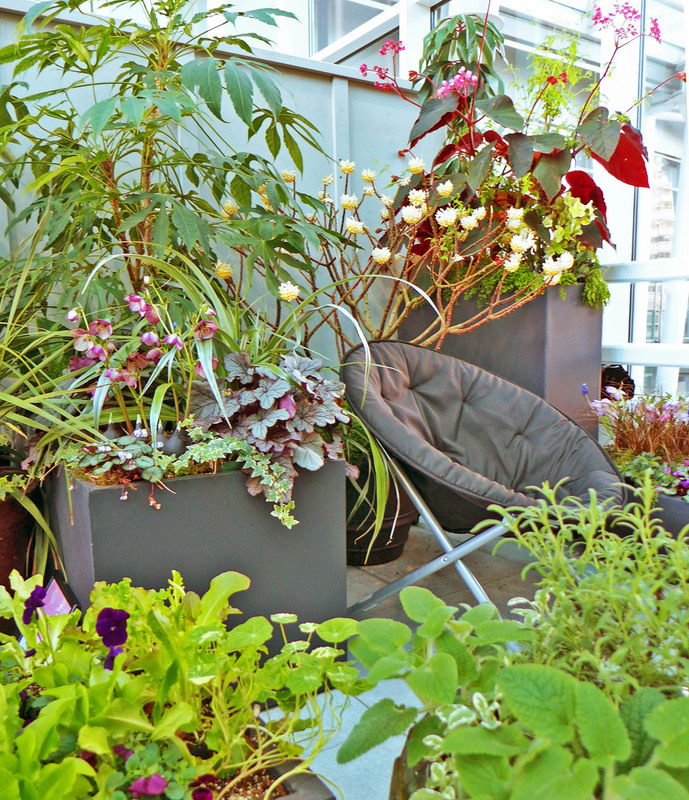 This garden represented the trend towards creating a personalized space that reflects the owner’s specific tastes and preferences, in this case a plant collector with a penchant for the bold! 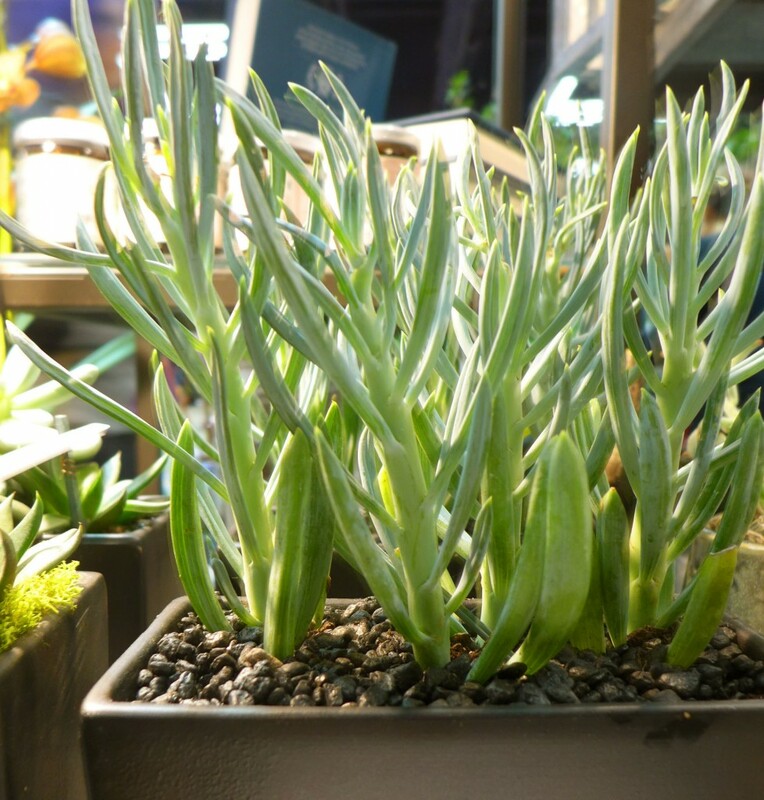 This display won the award for ‘Best Plant Material’. 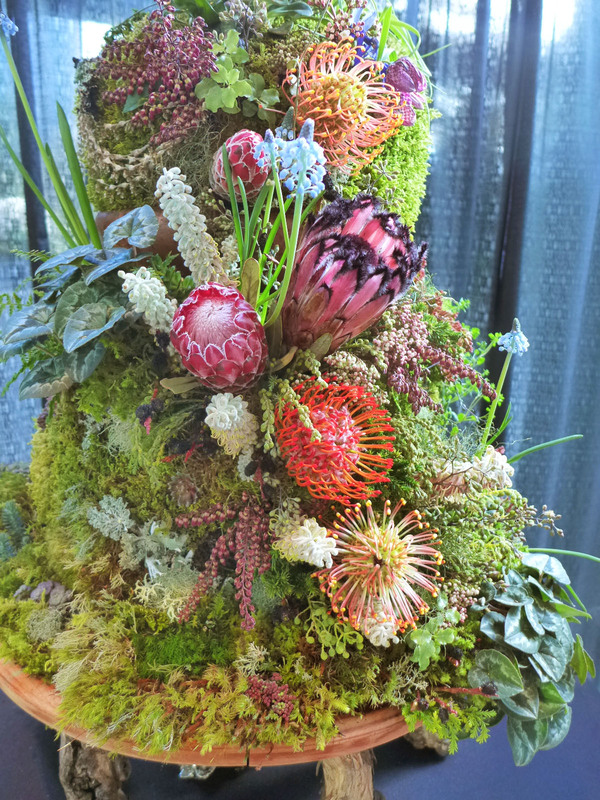 One of the most innovative and creative entries for the entire show came in the floral competition. 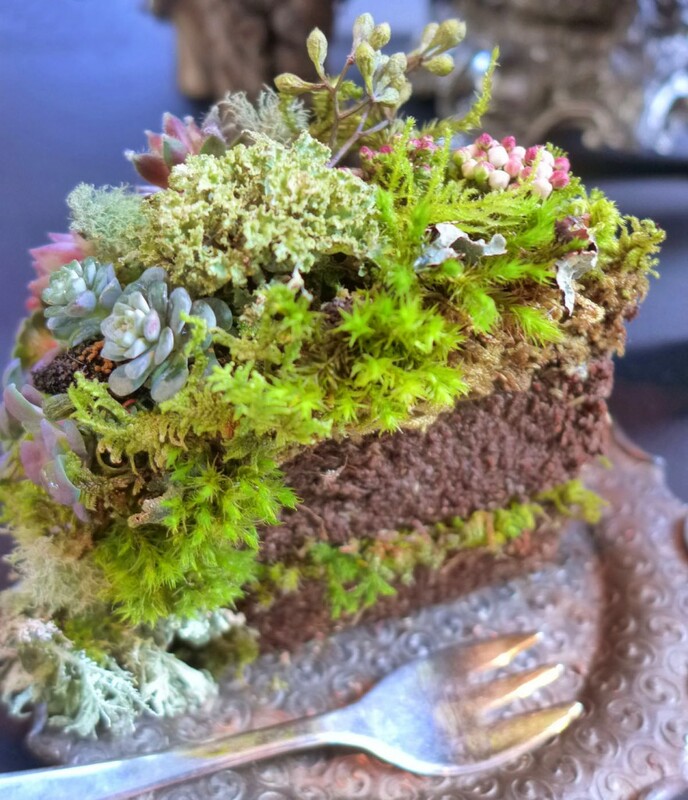 Mari Malcolm of Lusher Life Studio created a multi-layered woodland themed wedding cake covered in botanicals ranging from lichen and moss to succulents and proteas. The result was stunning! The inside of the cake was made with Floral Soil, an eco-friendly alternative to floral foam, that looks like chocolate cake when sliced. The detail was outstanding and deservedly honored with the People’s Choice Award as well as second place overall. 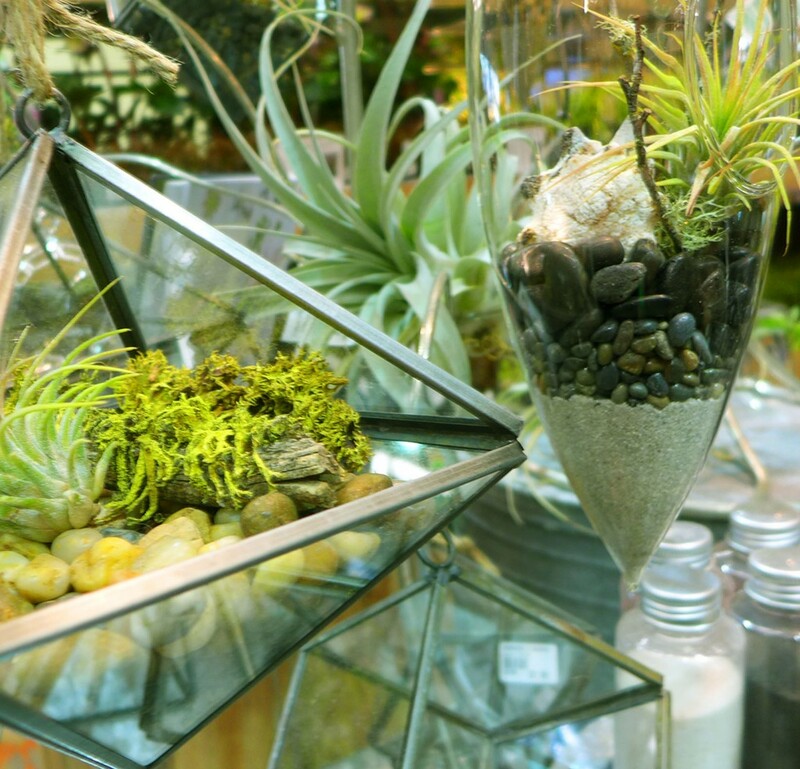 Glass terrariums, perfect for indoor gardening, were available in the market place. These geometric and teardrop shaped hanging planters from Swanson’s Nursery, were especially sweet. 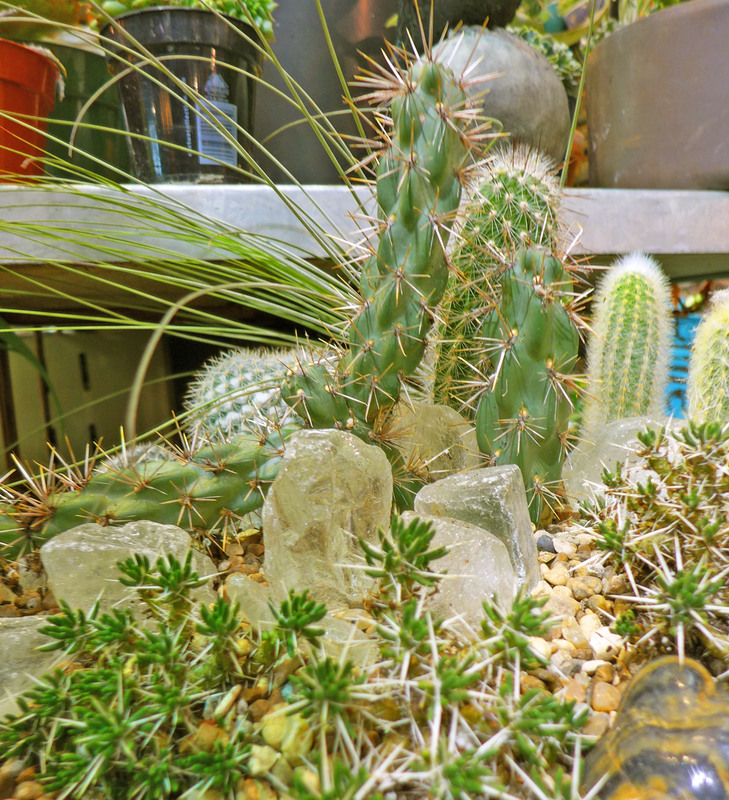 Even in the rainy Pacific Northwest, drought tolerant, easy care plants such as cactus and succulents were featured throughout. DIG Floral and Garden had several arrangements to choose from. Succulents continued to make a strong showing as well. 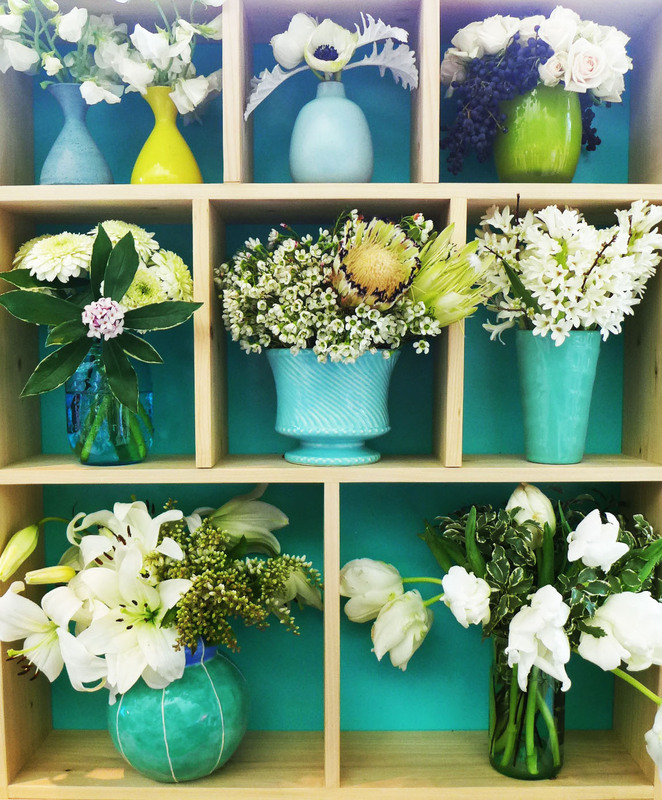 They’re perfect for a sunny window sill and super easy to care for! All in all, it was another fantastic show. Next year’s show will be held February 17th through the 21st. Mark your calendars now. Trust me, it’s not to be missed! Beautiful post Courtney:) So many inspirational gardens at the show captured so well here.. SO proud of my sister, Vanessa Kimling, on her award winning design for Ravenna Gardens. Thank you for this post and pictures!